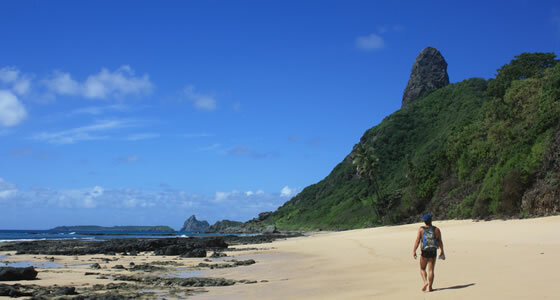 Hiking in Fernando de Noronha. For those who like to explore a place by foot and in the midst of a scenic landscape, Fernando de Noronha offers ample hiking opportunities. There are 5 main trails, 3 inside the National Marine Park and 2 on the outside, providing a total of about 12 hours of hiking. The trails also link the various scattered remains of the 18th century forts. Each of the five trails, which vary in length from 2 – 5 kms(1,2- 3,1 miles), allows for the observation of a particular characteristic of the island’s plant and wild life.The trail leading up to the Baia dos Golfinhos is an easy hike and provides the opportunity to observe the antics of the spinner dolphins, while the trail leading to the Baia dos Porcos has good panoramic views, and the chance to spot rookeries and swim at one of the best spots on the island. The Schrad Grass trail which provides views of the beautiful and wild Praia do Leao, is a bit more tricky, as one has to maneuver a rocky area.Moving forward on this same route you can complete the longest trail, which leads to the lighthouse at Ponta de Sapata. A more historical hike or rather walk, for those so inclined, would be a visit to The Palacio of São Miguel, the Noronha Museum, the Church and Fort of Nossa Senhora dos Remédios, located in Vila dos Remedios and well as the other forts remnants located all over the island. These shed light on the diverse history of this tiny island. Make sure you have a good pair of hiking shoes/boots, especially if attempting the trickier trails. Seek guidance from an authorized island guide. Apply adequate sun block in order to avoid getting burnt.